Objective:to serve the youth on Gabriola Island by supporting them in staying resilient in their lives. We work with the developmental processes of this age group. We establish activities that focus on problem solving skills. We examine how much that is related to getting along with others and negotiating relationships. Through play, creative pursuits, physical activities, and a youth generated curriculum, we engage this age group in prevention programs that support skill development. Our programming is designed to insert as many developmental assets as possible into the environment of these youth's lives, while the content challenges them in developing the necessary internal attitudes to support them in order to thrive in their lives. With problem solving and social skill development as the core skill sets, we offer fun and engaging programs that build supportive trusting relationships with attending youth. Mondays to Fridays, after school, ages 5 to 12. The After School Licensed Care Program runs five days a week during the school year. The developmental needs of this age group places our focus on enhancing problem solving skills and overall social competencies to meet the objective of promoting resiliency. The program is structured with a primary focus on relationship between staff and program participants and between program participants and their peers. We use arts, games, crafts, discussions, peer leaders and spontaneous interactions to enhance their social skills. This programn links into our leadership initiatives where youth ages 11 - 12 act as peer leaders for this group, and implement much of the curriculum that covers problem solving and social competency. Peer helpers in Training ( PHIT ) runs for eight months of the school year. It is an intensive interactive learning experience that focuses on skill building. As these youths are on the brink of entering the world of adolescence, we spend two afternoons a week facilitating their ability to communicate and listen to others, clarifying personal values, and learning how to make healthy decisions. The program's focus is on peer helping or "leadership through service." The youth spend one afternoon a week covering the training modules. They spend the second afternoon practicing their skills working with the youth in the After School Licenses Care Program and building community-change projects. We accept 10 youths a year into the program. HOPE for Grade 7's promotes resiliency among our youth ages 11 to 13. Resiliency is the ability to overcome obstacles. There are many real obstacles that youth face today as they navigate their way through the terrain of modern day adolescence. The question of how to support our youth has been answered by many different strategies. The HOPE for Grade 7's program interacts with youth through the perspective of prevention. The program equips our youth with the tools they need to keep themselves from harm. Our focus is to educate, motivate, and facilitate youth's understanding of the power of making personal choices. This program runs throughout the school year. Our focus also includes establishing trusting relationships with the Grade 7 youth in order to provide a safe support the following year when they will attend high school off island. Kids Summer Fun Day Camp is back for 2012. This is a summer program of the HOPE Centre, for children ages 5 to 12. 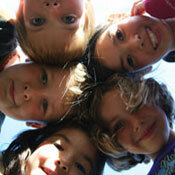 Children will have tons of fun while developing self-assurance, as well as social and problem-solving skills. Each Day we provide a nutritious midday snack. The types of activities offered will include: Arts, Crafts, Games, Field Trips, Theme Days, Hiking, Biking, Outdoor Sports, Activities at local beaches, Drama, and Movies. The program runs daily from Monday through Friday, 9:00 am - 5:00 pm. Beginning Tuesday, July 3rd, through the summer to Friday, August 31st. Sign up your kids for the whole summer, a week, or for just a day. Registration forms are available at the HOPE Centre or call 247-8020 and speak to Wendy Vigh. Sign up in advance - Space is limited. Cost: $35. per day, per child. Subsidies are available if eligible.